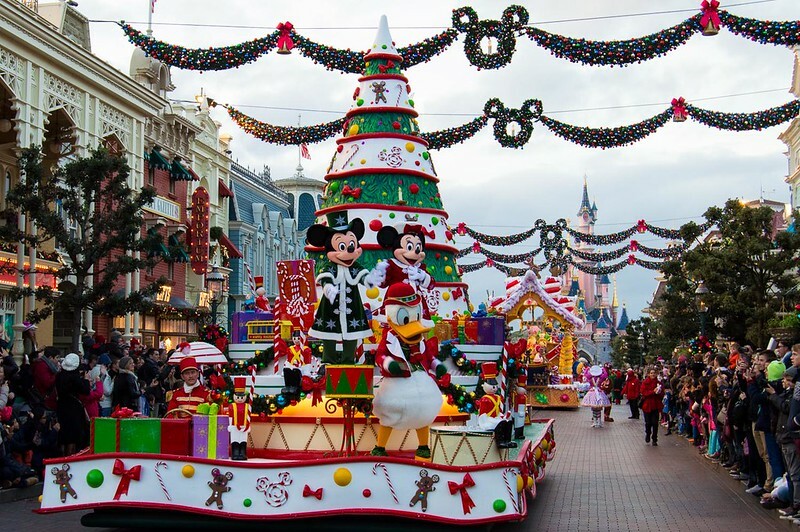 Disneyland Paris pulls out all the stops for the merriest time of year. From its festive decorations to fantastic seasonal entertainment, DLP is positively magical this Christmas. 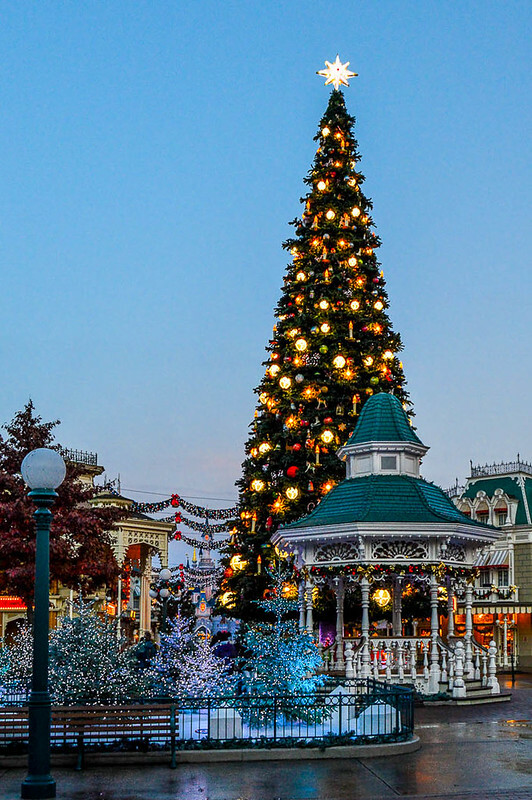 With twinkling lights, Mickey shaped garland and one enormous Christmas tree, Disneyland Park looks ready to celebrate the season in style. Take a photo tour of what all that extra holiday pixie dust brought our way. From the Town Square Winter Wonderland, down Main Street U.S.A. and finally a visit to the Fab 5 in front of Sleeping Beauty’s Castle, the pictures just don’t do it justice. But it might help if you perused whilst listening to this. Join Mickey and the gang for a festive parade complete with catchy Christmas tunes, dancing gingerbread men, and the best part of all – SNOW on Main Street. Plus this year welcomes the brand new Sugar and Spice float. See it all here. 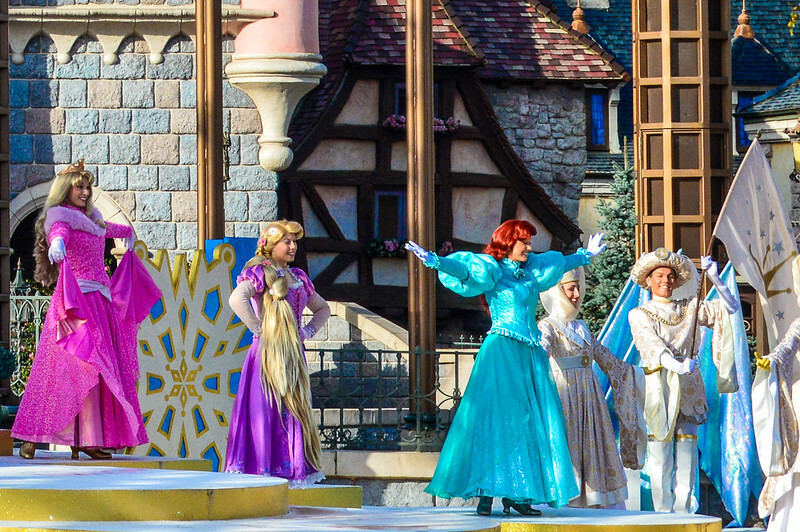 Every morning join Ariel, Belle, Sleeping Beauty, Merida, Tiana, Snow White, Cinderella and Rapunzel as they gather for a short song and dance along with their royal court (aka the flag people). The promenade begins at the entrance to the castle and continues to the castle stage, so the very best views will be from the raised platform directly across from the stage. Once their number is up (about 5 minutes), Disney brings in the heavy hitters. Anna and Elsa take the stage for an abbreviated version of Let It Go. Overall, the Princess Promenade is cute addition to the Christmas entertainment line up, and a great way to catch a glimpse of and sing along with the Frozen sisters. 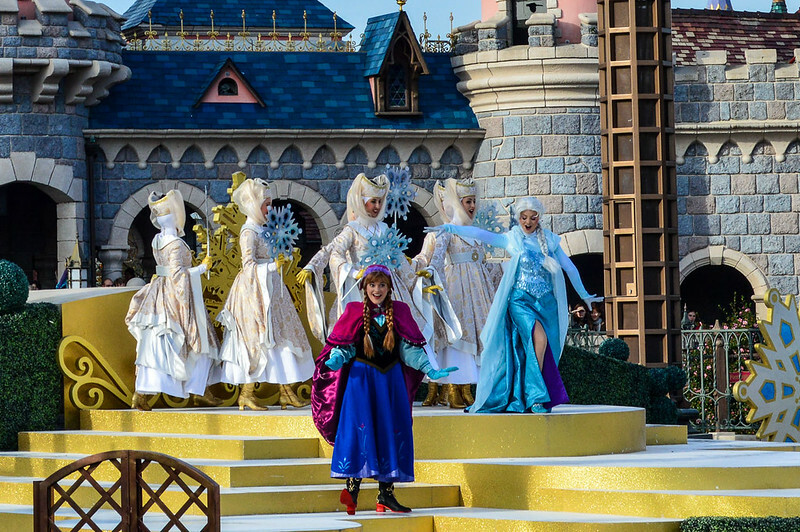 If past performances are any indication, guests should arrive at least 45 minutes early to get a prime spot. Visit the big man himself in Santa Claus Village at Cottonwood Creek Ranch. It’s a lovely area with several great photo ops along the way. Queues are often very long, so if this is a priority head there at opening or during lunch hours for shortest lines. 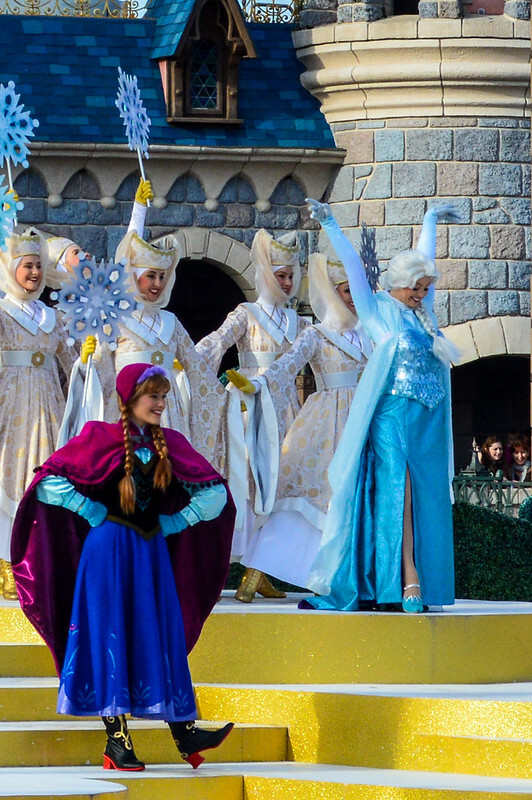 The pièce de résistance this season is the epic finale to your Disney day: Disney Dreams!, now with more Frozen. Olaf is your hostess with the mostest as he takes you through a delightful string of Christmas classics and a whole lot of Let It Go. The gang from Toy Story returns along with some old favorites, but so as not to spoil the surprise, I’ll stop there. But, make sure to get there early, not only to secure a spot, but to catch the musical fountains show that begins about 10 minutes prior to the start of Dreams! 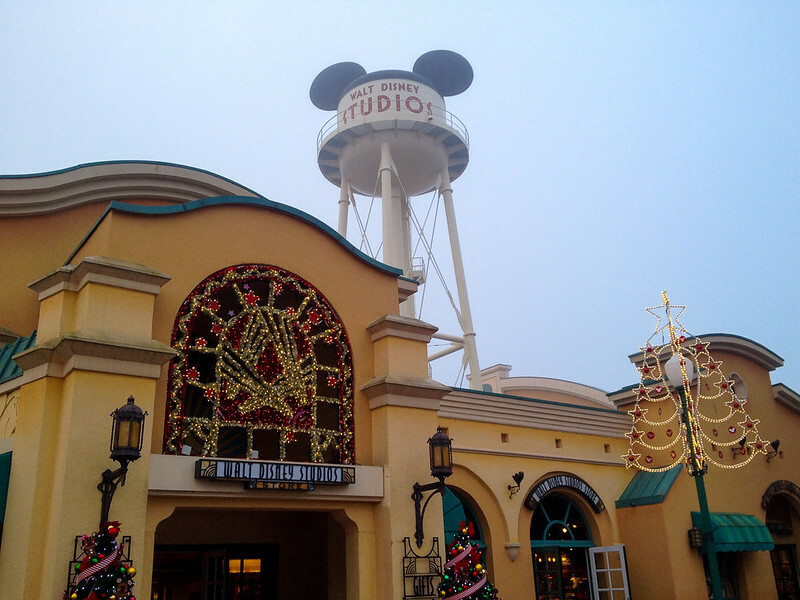 Walt Disney Studios brings the holiday sparkle to DLP, Hollywood style. Along with the glitz and glamour, the big band style Christmas music that plays through Studio 1 is probably my very favorite part of the celebration. Take a festive walk through here. 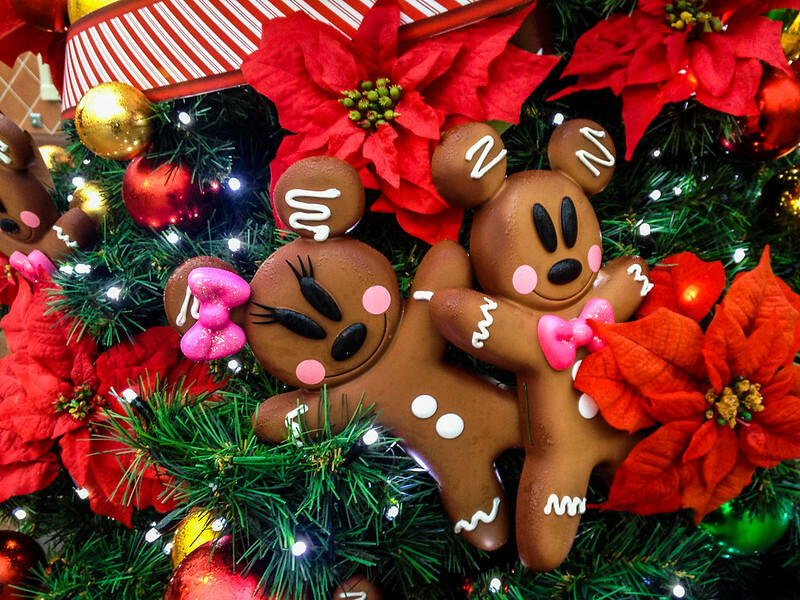 DLP’s Christmas themed food offerings aren’t as extensive as what you’d find in Disneyland or WDW, but there are a few treats to be had around the the parks. 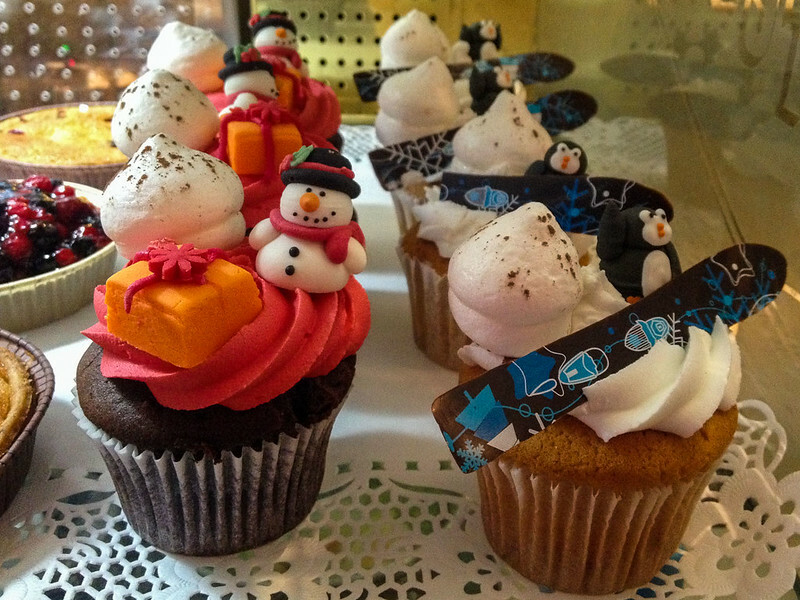 First up: Holiday cakes and cupcakes can be found at the Cable Car Bake Shop and Market House Deli, while Frozen themed eats are available at The Old Mill and March Hare Refreshments in Fantasyland. The best thing to come out of the kitchen at DLP this holiday season? 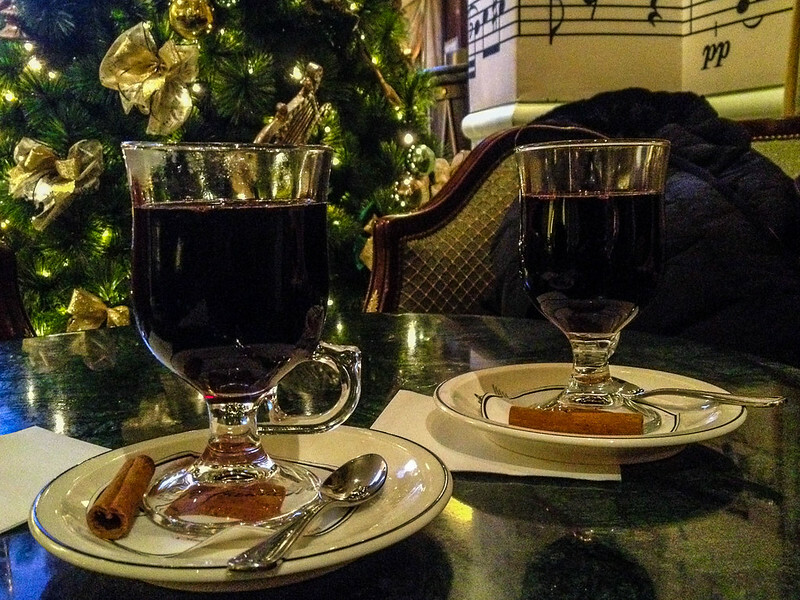 Vin chaud (hot mulled wine), that is the perfect balance of nutmeg, cinnamon and yuletide cheer. For the very best atmosphere head to Café Fantasia where you can drink this liquid Christmas surrounded by festive decor and soothing holiday piano tunes. If you’re on your way to Earl of Sandwich and find yourself in a thirsty bind, vin chaud is also available at the Christmas market in Disney Village. And finally, if you just can’t make it out of the parks (we’re looking at you Princess Pavilion), rest assured you can find the good stuff at March Hare or The Old Mill. You need something to wash down that Frozen cupcake. After the not-so-enjoyable ‘Halloween on a Plate’ offered in October at a handful of restaurants around DLP, we’ll be skipping the Christmas menus this time around. If you’d like to try your luck, special combination meals are available through January at The Lucky Nugget, Chalet de la Marionette, Café Hyperion and Restaurant en Coulisse. A lovely Christmas market has sprung up in Disney Village this season with small chalets offering everything from pain d’épices to roasted chestnuts, cotton candy and mulled wine – it’s a great, festive set up, with oversized presents and Christmas trees making for fun photo ops. In addition to the Disneyland Hotel’s elegant Christmas decorations, hotels around Lake Disney are getting into the spirit as well. Take a break from the hustle and bustle of the holiday park crowds and try a walking tour of the resorts – I mean, could Sequoia Lodge’s fireplace look any more inviting? 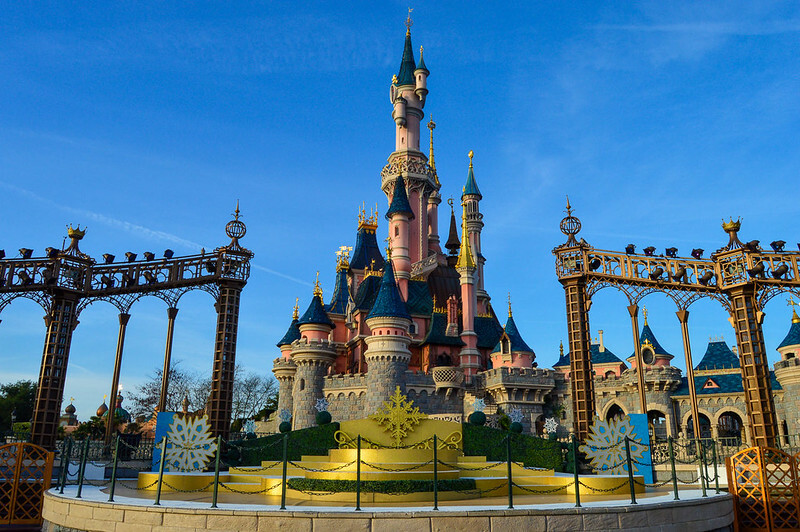 Overall there’s quite a bit to see and do this holiday season at Disneyland Paris. As always, the parks are at their most magical this time of year, with twinkling lights and Christmas trees around every corner. With the very merry celebrations come the not so merry crowds, so if there are activities or characters that have made it to your must do list, make sure and arrive early. It really is the most wonderful time of the year at DLP.